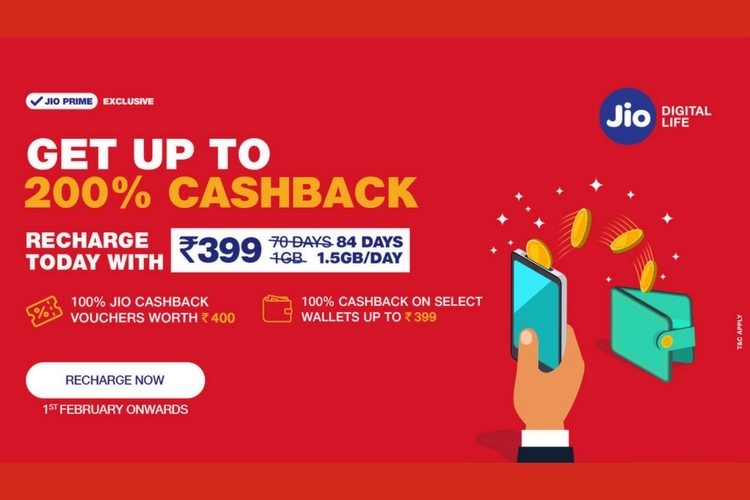 Reliance Jio has been quite consistent with their announcements when it comes to their cashback offers. The company has been introducing new offers every month since November and now, Jio has announced a new offer, under which the customers can avail benefits of up to Rs. 799 in the form of recharge vouchers and wallet cash back. Under the new offer, the company is offering up to 200-percent cashback to its Prime members. The Jio prepaid customers making a recharge of ₹399 or above are offered a total cash back of up to ₹799. As always, there’s a catch. Out of the total cashback of ₹799, only ₹400 comes directly from Jio. The remaining amount will be offered by Jio digital wallet partners. In fact, even ₹400 cashback from Jio will be offered will be offered in the form of eight vouchers worth ₹50 each. Lastly, in order to avail the cashback, the customers are expected to do a minimum recharge of ₹399 to get those vouchers. Now, coming to the cashback offered by Digital wallets, the customers will get cash back of varying value from MobiKwik, Paytm, Amazon Pay, PhonePe, Freecharge, and Axis Pay. The value ranges from ₹30 to ₹399. Additionally, if you do a recharge of ₹399 or above using MobiKwik or Paytm, you’ll be offered additional benefits such as a hotel voucher of up to ₹2500 from MobiKwik, etc. Well, if all this sounds a lot complicated, then head over to Jio’s official website and check out the offer details for yourself. It is also worth noting that the ongoing cashback offer will run till February 15, and it is valid only for prepaid customers.